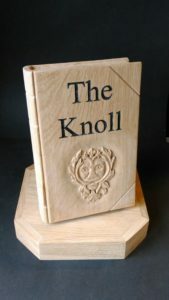 These two carved books were designed to fit on the driveway gateposts of a customer last year. 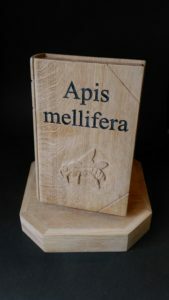 He is an author and a bee keeper, hence the carved motifs. 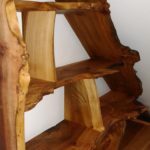 They are made from locally sourced wood, hand carved and each made from a single piece of oak. Finding furniture for under the stairs can be a problem in small cottages. 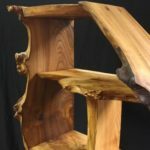 Last year a couple came to my workshop to see if I could come up with a solution for their house. They wanted a bespoke piece of furniture, something with cupboards and shelves which would fit a small area under the stairs. Something in the dresser style. 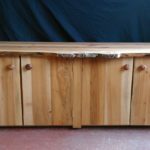 We talked over the design elements they required – natural edges to the wood, locally sourced Wych Elm, how many shelves number of shelves and what spacings were preferred between the shelves, and allowances for electric sockets on the wall behind the cabinet , among others. They told me exactly what they wanted. I just had to make it for them. Also it had to be ready for Christmas! It is 5′ 5″ tall ( 1650 mm ) and 5′ ( 1520 mm ) wide. The lower cabinet is 22″ high ( 560 mm ). The handles and the bun feet are all hand turned, from burr elm. The whole cabinet was finished with 3 coats of Danish oil. 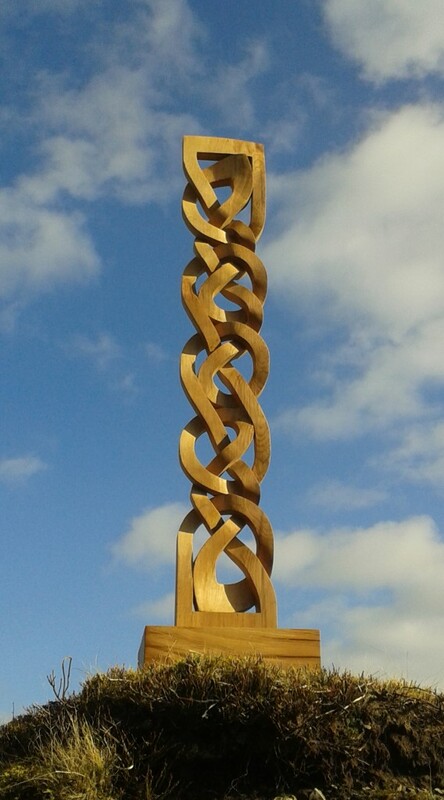 This Celtic knotwork carving was made from a single piece of oak. The base, or plinth, is also a solid block of oak, which gives it great stability. 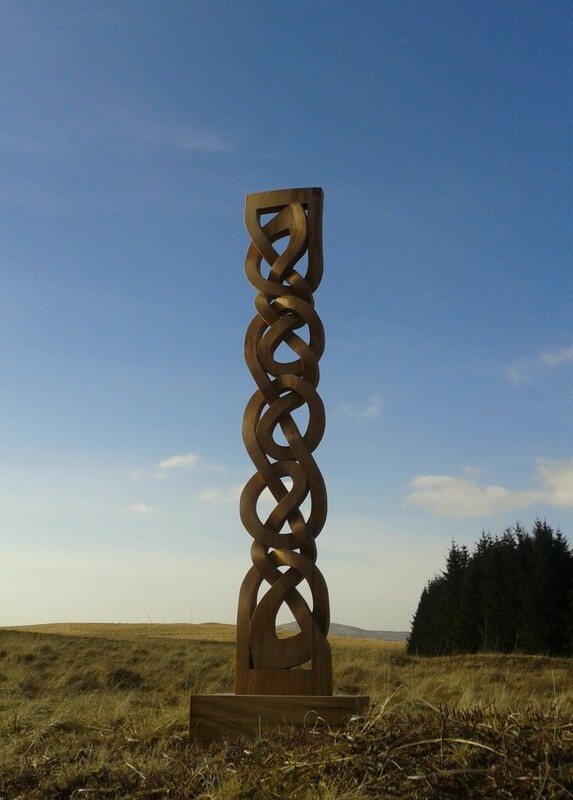 It was hand carved for a customer in Ohio, USA, who had visited Scotland and wanted a sculpture to go in his garden as a reminder of his travels. He liked the design of another Celtic knotwork carving that I had made, but wanted a larger version. This is the larger version. The orginal design had been exhibited at the Royal Scottish Academy, in Edinburgh. 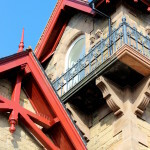 The Barnton Hotel Restoration Project in Edinburgh brought an empty and abandoned hotel back to life. 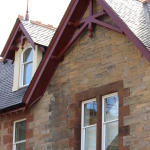 The building had been empty for years until it was transformed into residential flats and care home. 2014 certainly proved to be a very busy year for me. 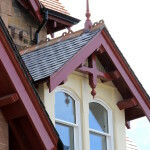 I was commissioned to replace much of the exterior specialist joinery by Page/Park Architects in Glasgow along with CCG Scotland Ltd, the contactors. 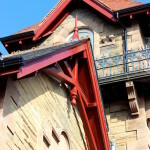 There was a lot to do because most of the detailed joinery was beyond restoration or saving. 1. View of gable and tower, former Barnton Hotel. 8. 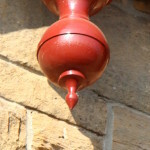 Pendant finial, painted and fitted. I made replacement finials and pendant finials in reclaimed Scots Pine. 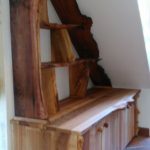 All were turned by hand using original surviving joinery as templates. 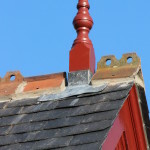 I used new red wood to make the decorative gable trusses and soffit posts, again copied from surviving originals. 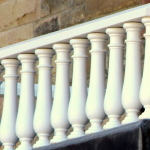 The exterior balustrading and handrails were made from hardwood. A few of the original balusters survived and only needed simple restoration work. All my work for the restoration was carried out in my workshop, while the contactors fitted all the joinery themselves on site. We did some research too. The original colour for the paintwork came from a hand tinted postcard from 1905 which we found online. This colour was used for the final finish ! All exterior images above courtesy of Sylvia D’Arcy. Pictish carvings have always interested me, so earlier this year I carved some Pictish symbols in the style of pre-Christian Class 1 stone carvings. The designs of the Pictish carvings were simply hand carved, or incised into the wood, in this case Wych Elm, with an oak base. The stones themselves usually have pairs of symbols together, and Class 1 stones are possibly re-used earlier standing stones. I carved each symbol onto individual pieces of wood, rather than have them in pairs, which was quite common. I would like to explore the different styles of these carvings further. 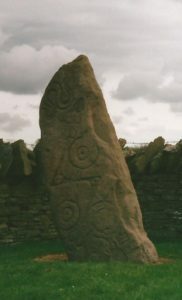 The later stones included borders, patterns and figures, as well as the symbols. Although the meanings of the carvings are unknown, they are one of the earliest symbols of a cultural identity found uniquely in Scotland. Pictavia near Brechin and the Groam Museum in Rosemarkie are two great places to see original Pictish carvings and designs. Of coarse, stones can still be seen at their original locations, like Aberlemno in Angus, which has symbol stones and a Christian cross with symbols and a battle scene. I think they are great places to visit and see these unique Pictish carved symbols. I was interested to find out if any of my ancestors had played a part in the battle, or the Wars of Independence in general. I started some simple research into my surname, Fyffe, which I already knew to be a part of Clan MacDuff. In medieval times the head of Clan MacDuff was also the Earl of Fife. He was of ancient Celtic lineage with noble rights and duties, one of which was the honour of crowning the King of Scotland. Duncan (III) MacDuff, the 11th Earl of Fife, was one of William Wallaces four leaders at the Battle of Falkirk in 1298. He was killed in the battle. Duncan (IV) , the 12th Earl of Fife, was still a minor in 1314 and a prisoner under the tutelage of Edward I of England. Therefore he took no part in the Battle of Bannockburn. His two brothers , however, fought on. 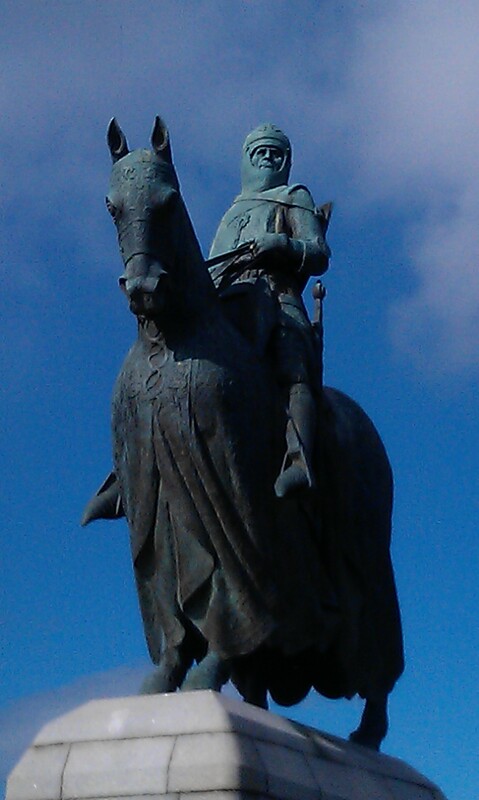 His sister, Isabella, crowned Robert the Bruce King of Scotland. In November 1314 Duncan (IV) was released and immediately affirmed his allegiance to King Robert the Bruce. In 1320 Duncan (IV) was first in the list of signatories of the Declaration of Arbroath. 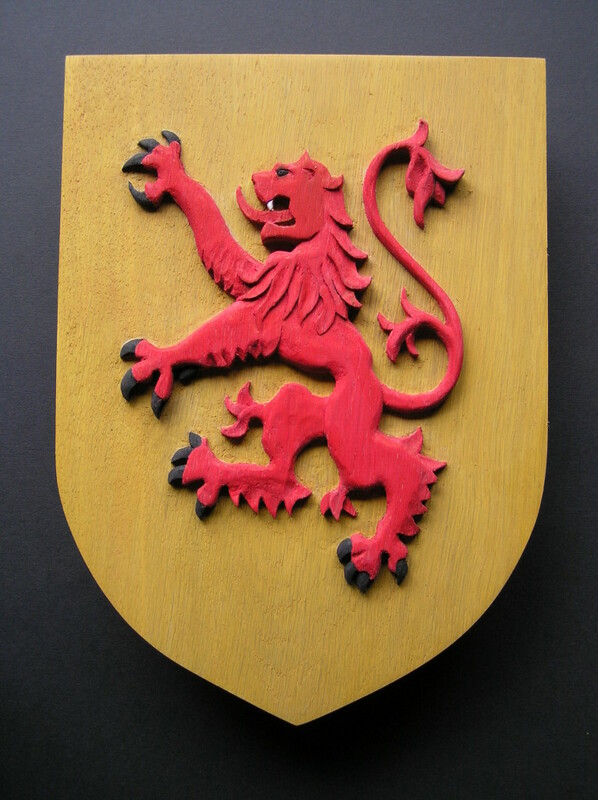 I also discovered that the shield of Clan MacDuff and the Earl of Fife was a red lion rampant, on a gold background, similar to the ‘Scottish Royal Standard’ but without the red lined border. A plan was beginning to form in my mind as to how I could make a personal commemoration of the Battle of Bannockburn. By chance we were driving from Perth to Dunfermline via Oakley, on the Balgonar road into Saline. I visited Scottish Wood for materials for a project I was working on. It was a clear sunny day and from the hill road we could see Stirling and the Wallace Monument in the distance. I thought of the Men of Fife making their way to battle and remembered my plan. At the timber yard I bought some oak boards for carving. The oak was sourced very nearby and also nearby was the ruin of MacDuff Castle, burned down by Edward I in 1306. 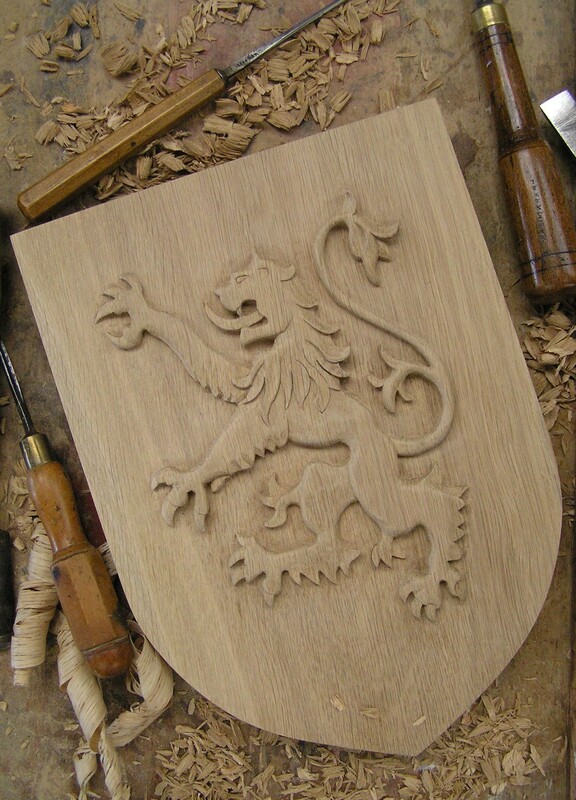 I decided my carving was to be the shield of Clan MacDuff and the old Earls of Fife. How perfect for it to be carved from oak sourced near to MacDuff Castle, in Fife, by a modern member of Clan MacDuff. I hope the ancestors smile and look kindly on my efforts. They fought and died for Independence. We only have to vote for it. MacDuff Shield, in full colour. After all the hard work of the many conservation project teams nominated for the trophies, the ceremony for the Nature of Scotland Awards 2013 finally took place. The winners were announced on 30th October at the Sheraton Hotel, Edinburgh. My involvement had been to design and make the actual trophies. The brief had been to use sustainably sourced local timber. I chose to use Scottish elm and sycamore. 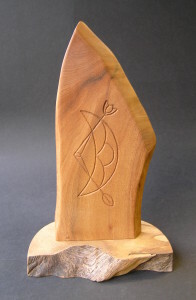 The trophy recipients details were all engraved directly onto the wood bases. The titles of the award categories and the sponsors names were also engraved. The wood was then given an oil and lacquer finish, which felt good to the touch and was durable. We were invited to the presentation ceremony where we had a lovely evening. It was great to finally see and meet some of the nominees whose names were engraved on the trophies, together with the RSPB team and volunteers, who had commissioned my work. A more detailed report on the event and winners can be found here. 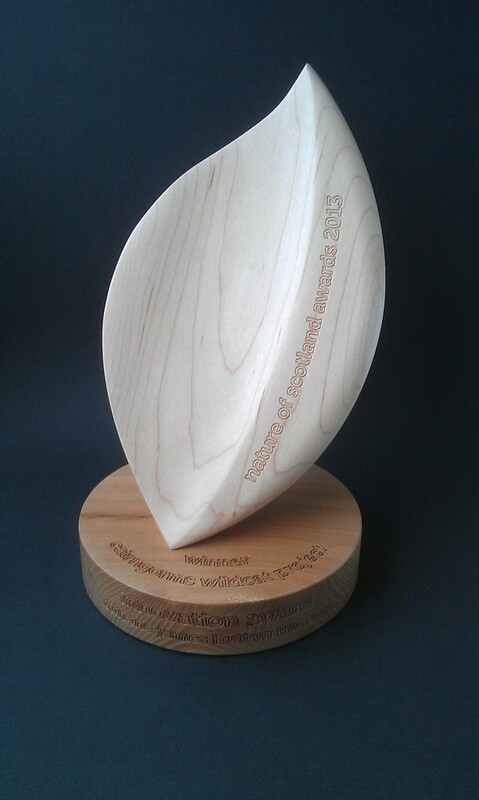 RSPB Scotland released news of The Nature of Scotland Awards 2013 yesterday. 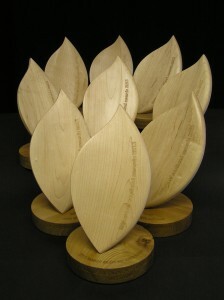 I am very happy to have been asked to design and make the awards, and will update this post soon. The awards ceremony takes place on 30th October at the Sheraton Grand Hotel in Edinburgh. In the meantime the RSPB Press Release tells the story. 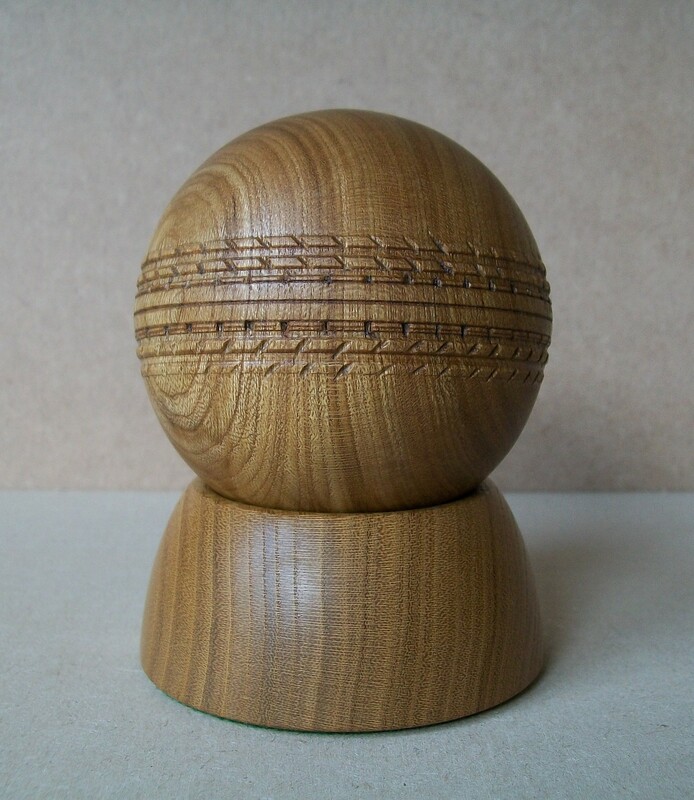 A recent commission was a decorative cricket ball and base. It involved both wood turning and carving. Turning for the shape of the ball and the base, and carving the detail on the ball – 6 rows of stitching! It is a copy of a 1937 match ball. 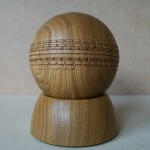 This one is turned from Laburnum although Oak or a fruitwood would also work well. It was made for a private client but I have put the image into the Trophies Gallery as it could be an excellent trophy or award for a cricket team or individual player. 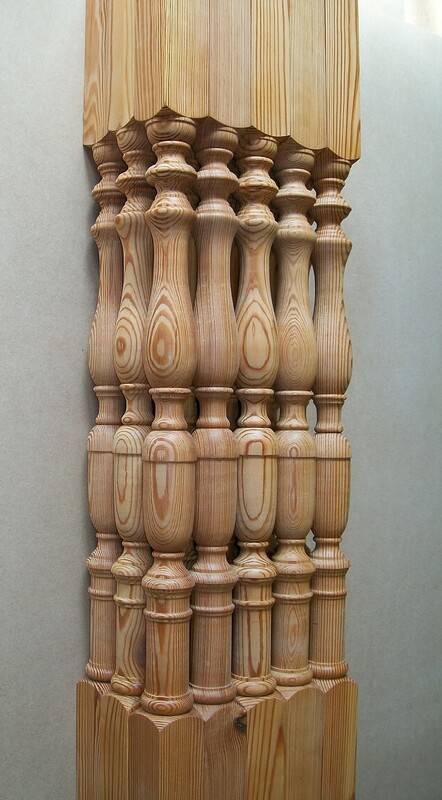 These spindles in reclaimed pitch-pine were hand turned to match an original Victorian pattern for a clients house extension, and are an example of the architectural woodturning I often get asked to do. 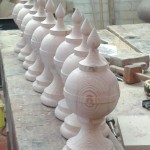 They are now ready to be dispatched to the client who can complete another stage in their building project. 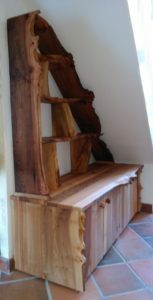 The pitch-pine I used was very well seasoned and a perfect match for the original wood. It was reclaimed from 200 year old beams salvaged from a demolished mill. 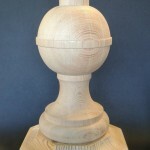 The client gave me an original spindle to use as the template. Once the spindles were turned I gave them a thin coat of lacquer to seal them. It won’t take long before the colour blends nicely with the original staircase in the clients house. 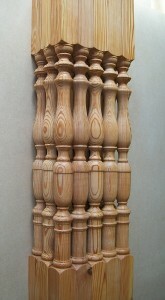 I can also make balusters like this in oak, Douglas fir, mahogany or another timber to suit the client. Images, Text and Content Copyright Neil Fyffe 1993-2018. All rights reserved. Image of “Knotwork No. 3” courtesy of Sheila Lithgow.